Posted by Doriano "Paisano" Carta in Search. Do you know that you could actually create your very own google search engine that will search only the websites and resources that you specify? Simply go to Google’s Customized Search and create as many unique types of search engines as you want. You can customize the look and feel and even embed the search engine on your own website and invite others to contribute resources for the search engine. As a freeware junkie, I am always looking for the best freeware tools and utilities, so I’ve stock-piled a great collection of websites that offer freeware. It made sense to build a freeware search engine that would search through only these freeware sites, thus providing valuable and relevant search results every time. It’s also a great time saver because it means you no longer have to visit each and every site to perform your searches! Now you can perform your search from one place. Cool, huh? Select whether to search just the sites you enter or the entire web or a combination of both. Click on the control panel to make changes such as the look and feel or to add/remove websites, etc. Summation: What search engine can you build today? The possibilities are endless! Think of your niche and field of interest or expertise and create a search engine that serves that need. Posted by Doriano "Paisano" Carta in Freeware, Web 2.0. ControlC is a unique new service, that’s for sure. In a nutshell, what it wants to be is your virtual clipboard, allowing you to copy and share (instead of paste) via the web. I like the concept and the way that it saves everything in one place for easy retrieval from anywhere any time you want it again. Best of all it’s free and easy to use. The only downside to the experience is that it requires a small download and installation of a tiny utility that needs to be running at all times in your system tray. and Mac OS and of course windows. As for security concerns, some will be hesitant when it comes to openly sharing what they dump to their clipboard and rightfully so. Sometimes those items can be login names and passwords or account numbers or credit card numbers, etc. Well, ControlC realized that much and provides encryption automatically for everything you copy which is a great move on their part. Personally, I love using my JingProject account to take screenshots and immediately sharing it via the web to anyone I want but I might use ControlC more just to see what else it can do in comparison. Note: The free basic version only allows you to access things you’ve copied in the last 5 days. You will need the premium version to access anything older than that. Posted by Doriano "Paisano" Carta in Enterprise, Freeware. In all my years working in I.T. the thing that has always made me cringe is the way that people handle their login account information and passwords. I cannot tell you how often I’ve seen login names and passwords attached to monitors on sticky notes or taped to their desk or keyboard. The more security conscious ones actually try to be more safe by storing their passwords in their drawer, which still isn’t that smart really. The next level of security is taken by those who store all of their passwords in a Microsoft Excel spreadsheet, which is better than the post-it method of protection, but it’s still vulnerable because their isn’t any encryption which makes opening the file very easy. This is a serious matter that should be addressed by every organization, no matter how large or small they are. One security breach and any company can be exposed to devastating results from a potential hacker. So what’s the answer? What can be done about this all too common problem that occurs in every company in America? Well, the first thing to do is provide some basic security training for all employees. Make sure everyone understands WHY this is so important. It isn’t just for the company’s safety but for their own safety as well. The next thing to do is provide a simple method for storing all of their login account information and passwords, perferably one that also provides encryption for added security. Obviously, expense can be a concern so this solution shouldn’t be too expensive either. Now, there are countless password managers available these days, but to me there is only one ultimate gatekeeper. There’s a version for different operating systems, such as linux, Mac OS and of course all flavors of Windows. However, my favorite is the Portable version which doesn’t require any installation and can be launched from a USB stick! This means you can save the keepass program and the password database that it creates and encrypts for all your passwords in one safe place and with you at all times. Here’s the Keepass download page. Companies and especially I.T. departments need to stop sticking their collection heads in the ground when it comes to this grievous security risk and address it as soon as possible. Don’t assume that your users know better and would never be stupid enough to do such things. I cannot begin to tell you how many times I’ve seen these things done by individuals with extremely high levels of intelligence, multiple degrees and usually good common sense. 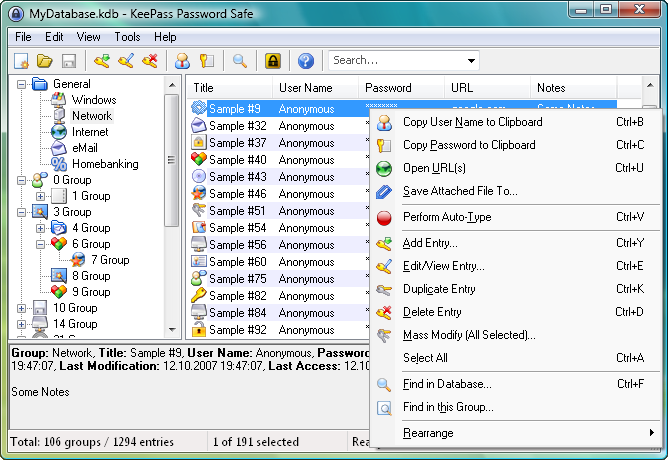 It only takes a few minutes and the Keepass utility is free and easy to use. 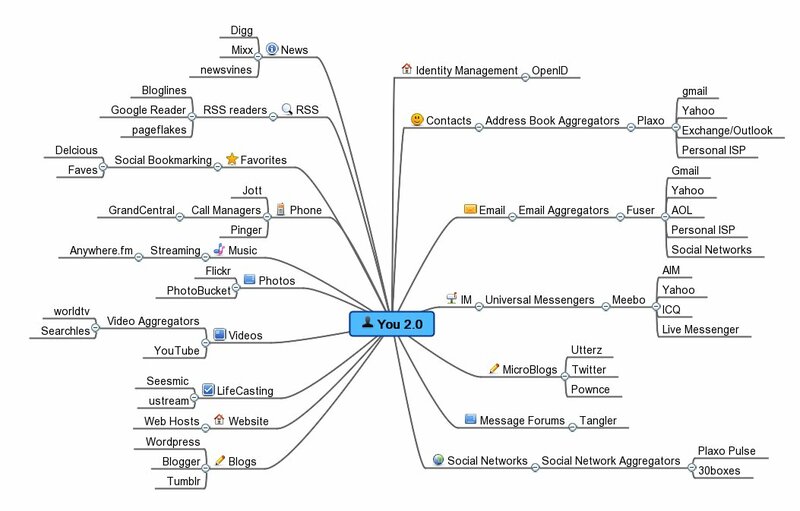 Posted by Doriano "Paisano" Carta in Enterprise, Networks, Semantic Web, social networks. LinkedIN is a fantastic networking service for business contacts, but wouldn’t it be even more useful if you could build your own version of this service within your own enterprise? Obviously, you would start with the relationships internally among all employees and then have links to their external contacts outside your firewall to other companies, social networks and other email systems. Everything would evolve from within your internal Outlook or other corporate email system and ultimately extend to external email systems such as Yahoo, Gmail and more. Well, you can do this and start for free thanks to Visible Path which has launched an innovative new service that does exactly this. Seeing is believing and a picture is indeed worth a thousand words so checkout their 2 minute screencast. I think you will be impressed as I was with what they do. I truly believe that they are onto something big here which will all be part of the future of the Internet and the Semantic web. Another positive move is Visiable Path’s decision to embrace OpenSocial standards which is a great sign for its future on the web as well as on the Enterprise.